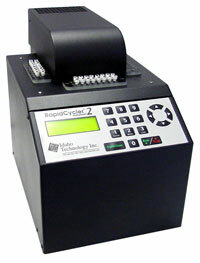 On this page the most prominent real-time PCR cycler are described. In the cycler descriptions the specifications and the advantages of the displayed systems are shown. Which real-time platform meets your requirements best, depends on your research application. Some of the systems are designed for research with low capacities and others are for high-throughput applications, most in combination with pipetting robots. A lot of the displayed cyclers use solid-block for thermal cycling, other use hot- and cooled-air. Most differences are obviously in the application software, especially in the way of data analysis and how the derived cycle of quantification (Cq is MIQE compliant) crossing points (CP) or threshold levels (Ct) are computed. Each of these systems employs either one of several general types of fluorescent probes for detection. There are also big differences how data are displayed and reported. Some of the limitations of end-point detection in (RT-) PCR have been assuaged in real-time PCR systems, a number of which are now on the market. These systems offer many general technical advantages, including reduced probabilities of variability and contamination, as well as online monitoring and the lack of need for post reaction analyses. Further, some of these systems were developed with contemporary applications such as quantitative PCR, multiplexing, HRM (high resolution melting) and high-throughput analysis in mind. Initial template levels can be calculated by analysing the shape of the curve or by determining when the signal rises above some threshold value. The breadth of instruments available for quantitative PCR (qPCR) has continued to grow in the past 5-10 years. With older platforms now being retired and an abundance of new technologies available to replace them, lab managers, technicians, and researchers will need to effectively compare and evaluate the performance of these platforms. While new features such as multiplexing, microfluidics, and integration with liquid handling automation have enabled higher throughput and lower operating costs, it has made it increasing complex to readily compare different types of instruments and their respective performance characteristics. As the list of features and specifications grows, understanding some of the key metrics of instrument performance will become critical for evaluating platforms that will best meet the needs of a laboratory’s application focus and assay requirements. Unfortunately, instrument vendors have not consistently conformed to any particular standards for defining and assessing performance characteristics of qPCR instruments and rarely have the methods been adequately documented in the product literature. The StepOne™ Real-Time PCR System combines plug and play convenience and uncompromising performance that is tailor-made for both first-time users and real-time PCR experts. By utilizing the full range of TaqMan® gene expression and genotyping assays, the StepOne System delivers the kind of high-quality results you've come to expect from the leader in real-time PCR. The StepOne System provides the power and flexibility experienced users demand, while its intuitive software guides new users through experimental design, operation, and analysis. Part of an elegant, optimized system solution for real-time PCR that includes software, reagents, and instrumentation, the StepOne System delivers remarkable performance with remarkable ease-of-use, at a price that can only be described as...remarkable. * The StepOnePlus™ Real-Time PCR System Upgrade is an easy upgrade solution for your StepOne™ System. You can go from 3 colors and 48 wells to 4 colors and 96 wells in no time at all. The Applied Biosystems® StepOnePlus™ Real-Time PCR System, makes it simple and easy to get high-quality real-time PCR results. This remarkably simple 96 well, 4 color, real-time PCR system is designed with a user-friendly, yet powerful, interface for researchers of all experience levels. The StepOnePlus™ system brings advanced real-time PCR technology to a new level of accessibility. Beginning at the StepOnePlus software homepage, you can seamlessly navigate through all aspects of the real-time PCR method including sample and reaction set-up, thermal cycling, and fluorescent detection. Focused application software analyzes and interprets experimental results. Depending on the experimental design, the system can even help you select and order real-time PCR reagents online by means of convenient links in the Design Wizard. Simply Remarkable Results - Because the StepOnePlus system is factory-calibrated for optical and thermal accuracy, simply remarkable real-time PCR results are available right out of the box. It can discriminate between 2 populations of 5,000 and 10,000 template copies of a TaqMan® Assay with 99.7% confidence. The StepOnePlus System supports any real-time PCR application. Experimental design wizards to help you design and set up experiments. Pipetting protocols and recipes to quickly set up experiments. Advanced setup for expert users who require flexibility for more complex applications, such as multiplexing. QuickStart setup so that you start a run immediately and enter plate information at a later time. Real-time monitoring of amplification growth curves enables you to view run progress. Remote real-time monitoring so that you can monitor progress from a remote PC. Email notifications to alert you when a run has started or ended. Auto-baseline and auto-threshold for simplified data analysis. Automated SNP genotype calling capability with intuitive graphical output and quality-value assignment. Tool tips for easy identification of sample wells when viewing amplification curves or SNP genotyping plots. Troubleshooting flags to help you diagnose and solve problematic experiments. Multiple plots view so that you can simultaneously assess data from four different perspectives. Easy cut and paste functionality. The Applied Biosystems 7500 FAST Real-Time PCR System is a versatile, leading edge platform offering enhanced performance capabilities and a future upgrade to high speed thermal cycling. Supports 96-well format plates and 0.2 mL tubes. 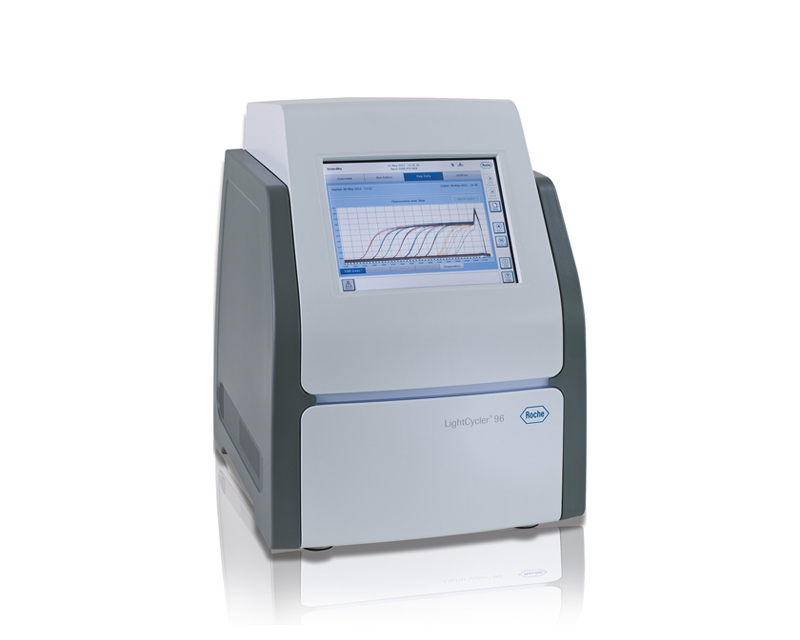 The ViiA™ 7 Dx Instrument puts high-productivity qPCR at your fingertips. With the new OptiFlex™ optical system and 4 interchangeable block formats from 96-well to 384-well to TaqMan® Array Micro Fludic Card, the ViiA™ 7 is available for in-vitro diagnostics use. Proven Applied Biosystems reliability and accuracy. Using with TaqMan® Array Micro Fluidic Cards provides an integrated workflow and faster results. Easy to use—intuitive software, responsive touch-screen, effortless block exchange without the need for any tools. 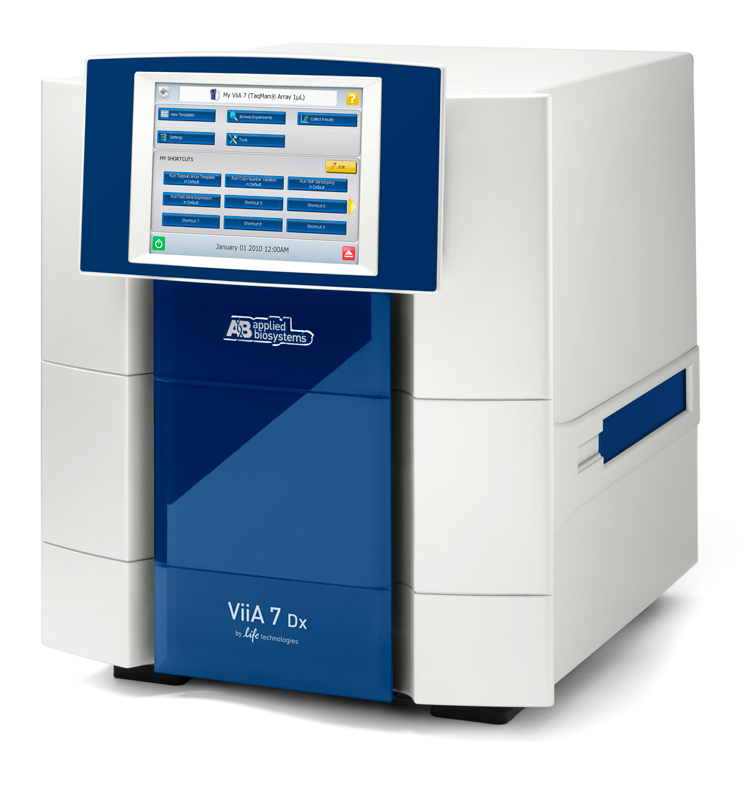 Ideal for performing medium- to high-throughput real-time PCR, the ViiA™ 7 Dx Instrument enhances your lab’s productivity. Quick block changes: Front access makes it easy to change thermal cycling block formats without having to move attached peripherals such as robots or computers. Easy touch-screen interface: Instrument touch screen provides one-touch protocols for fast and easy assay setup for a broad range of applications. Peace of mind: Data recovery capability for 100+ runs. The ViiA™ 7 Dx Instrument features the new OptiFlex™ System, which provides enhanced fluorescence detection. Maximum multiplexing: Six decoupled excitation and emission filter channels for the greatest number of dye combinations and maximum multiplexing capabilities. Flexible data collection: Multiple ramp method detection formats provide more flexibility for collecting data during a ramp stage. Precise quantification: Detect as small as 1.5–fold changes in target quantities in singleplex reactions. Flexibility. Versatility. Speed. Precision. Everyone’s needs are unique and that’s why we have expanded the QuantStudio® family of real-time PCR & digital PCR systems. Now you can pick the qPCR platform that best fits your research requirements—find your fit today. The QuantStudio® 6 Flex Real-Time PCR System is ideal for laboratories with multiple applications and end users on a limited budget. 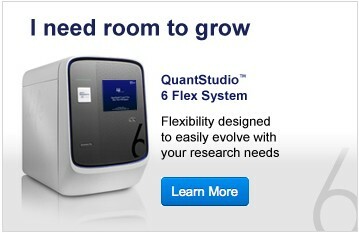 With a planned upgrade path to a QuantStudio® 7 Flex System that accommodates automation or TaqMan® Array Cards, the QuantStudio® 6 Flex System is an ideal qPCR platform to accommodate changing future needs. The QuantStudio® 7 Flex Real-Time PCR System delivers the proven reliability, sensitivity, and accuracy of the ViiA™ 7 System in a new industrial design. 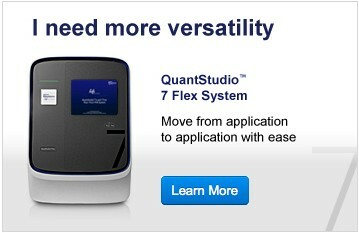 The QuantStudio® 7 Flex System has been optimized to enable the broadest range of quantitative PCR applications, with additional dyes, formats, and automation options. 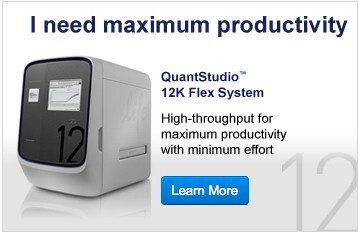 Combining flexible throughput capabilities with a streamlined workflow, the QuantStudio® 12K Flex system takes you from targeted discovery through confirmation and screening, all on a single platform. Increase your throughput by as much as 32-fold by running 4 OpenArray® plates in a single run on the QuantStudio® 12K Flex system. It's the equivalent of 32 traditional 384-well qPCR plates or 12,000 data points. When equipped with the OpenArray® block, a single 9700 thermal cycler and the QuantStudio® 12K Flex OpenArray® AccuFill™ System, the QuantStudio® 12K Flex system can produce up to 110,000 data points or more in an eight-hour day. For those that need the greatest throughput, add the QuantStudio™ 12K Flex Automation Robot and multiple 9700 thermal cyclers, and you can achieve over 2,000,000 data points in a day. Start a 12,000 data point experiment typically in 20 minutes or less. 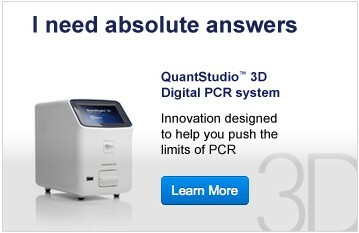 Now, you can go beyond the limits of real-time PCR with the new QuantStudio® 3D Digital PCR System. A simple and affordable platform, the QuantStudio® 3D Digital PCR System produces absolute quantification data with the precision and sensitivity you need for your more demanding applications. 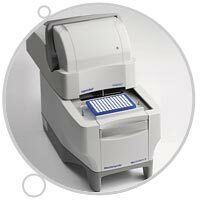 The QuantStudio® 3D Digital PCR System uses a sealed chip technology, providing a streamlined, reliable, and robust method for performing digital PCR. An affordable platform where you can just load and go—digital PCR is now absolutely attainable. The LightCycler™ from Roche Molecular Biochemicals of Indianapolis harnesses light technology licensed from Idaho Technology Inc. of Idaho Falls, and then adds some additional bells and whistles, such as a built-in microvolume fluorimetric detection system that enables real-time quantitative PCR. This system employs thin-walled glass capillary tubes, and typical PCR experiments can be performed in less than 30 minutes. Currently, this system supports two fluorescence-based methods for the detection of amplification products: the "general" DNA stain SYBR Green I (a product of Molecular Probes of Eugene, Ore.), or sequence-specific hybridization probe pairs. SYBR Green I exhibits very little fluorescence when free in solution; emission is greatly enhanced when it binds to the minor groove of the DNA double helix. Prior to amplification, the reaction mixture contains the denatured DNA, the primers, and the dye. The low-level background fluorescence signal generated by the unbound dye molecules is subtracted during computer analysis. After annealing of the primers, a few dye molecules can bind to the double strand. During elongation, more and more dye molecules bind to the newly synthesized DNA, resulting in dramatically increased light emission. If the reaction is monitored continuously, this increase in fluorescence can be viewed in real time. After denaturation of the DNA during the next heating cycle, the dye molecules are released and the fluorescence signal falls. A fluorescence measurement is performed at the end of the elongation step of every PCR cycle to monitor the increasing amount of amplified DNA. The hybridization probe format employs two specially designed, sequence-specificoligonucleotides lab-eled with fluorescent dyes. One oligonucleotide probe carries a fluorescein label at its 3' end; the other probe carries a different label (LC Red 640 or LC Red 705) at its 5' end. The chemical nature of the hybridization probes prevents their extension: one probe contains fluorescein at the 3' end, whereas the 5'-labeled probe contains a 3' phosphate moiety. The sequences of the two oligonucleotides are selected so that they hybridize to the amplified DNA fragment in a head-to-tail arrangement. When the oligonucleotides hybridize in this orientation, the two fluorescent dyes are positioned in close proximity to each other. The first dye (fluorescein) is excited by the LightCycler's light emitting diode (LED) filtered light source, and emits green fluorescent light at a slightly longer wavelength. When the two dyes are in close proximity, the emitted energy excites the dye attached to the second hybridization probe, which subsequently emits red fluorescent light at an even longer wavelength. This energy transfer, referred to as fluorescence resonance energy transfer (FRET), occurs efficiently only when the dyes are in close proximity (a distance between 1-5 nucleotides). Thus, in this type of assay, fluorescent intensity measurements are made after the annealing steps. The increasing amount of emitted fluorescence is proportional to the increasing amount of DNA generated during the linear phase of the ongoing PCR process. The LightCycler 480 Real-Time PCR System is a fully integrated multiwell-plate based real-time PCR platform for highly accurate qualitative and quantitative detection of nucleic acids. Building on the benefits of Roche's capillary-based LightCycler® Systems, it goes one step further in offering enhanced throughput, compatibility with automation equipment and maximum flexibility regarding hard- and software. 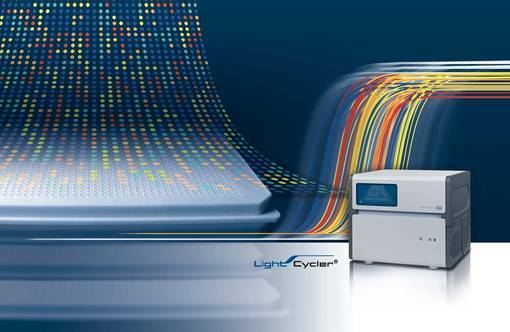 Providing novel ways to combine speed and accuracy without compromises, the LightCycler® 480 Real-Time PCR System meets the needs of a broad range of applications in research fields such as gene expression studies, discovery and analysis of genetic variation or array data validation. Benefit from novel thermal cycling and data capture technologies to achieve outstanding temperature homogeneity and assay reproducibility. Increase the sensitivity and yield of your real-time PCR applications, with robust LightCycler® 480 reagents and specially engineered clear or white consumables. Analyze true raw data, breaking free from the need to use passive reference dyes or normalization plates to get accurate results. Flexibly switch between 96- or 384-well plate formats, exchanging thermal block cyclers in just a few minutes with no recalibration time. Select from numerous assay formats and detection dyes, expanding the range of real-time PCR applications in your lab. Benefit from the intuitive and user-friendly Roche software interface. Take advantage of the automation capabilities of the LightCycler® 480 System, integrating it as part of a LIMS in combination with robotic pipetting and plate loading. Conveniently analyze gene expression or genotyping data using a broad range of basic and advanced methods. a software algorithm that analyzes the shape of the melting curves and groups those that are similar. Temperature shifting: the temperature axis of the normalized melting curves is shifted to the point where the entire double-stranded DNA is completely denatured. Samples with heterozygous SNPs can then be easily be distinguished from the wild type by the different shapes of their melting curves. Difference Plot: the differences in melting curve shape are further analyzed by subtracting the curves from a reference curve. This helps cluster samples automatically into groups that have similar melting curves (e.g., those who are heterozygote as opposed to homozygotes). Roche Applied Science´s LightCycler® family of real-time PCR systems offer fast, accurate and versatile platforms for genetic variation research. 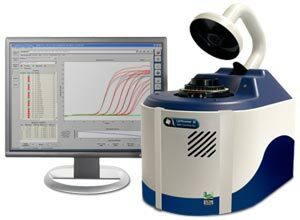 The new plate-based LightCycler® 480 System provides the temperature homogeneity and optical characteristics required for high-performance melting-curve analysis (MCA). On the level of data acquisition and available detection channels, this new instrument opens the way to more advanced applications in the emerging field of gene scanning where amplicons can be screened for unknown sequence variations with low efforts in time and cost. Real-time PCR is a well established technique for studying genetic variation using various probe-based methods for genotyping as well as high-resolution analysis of whole amplicons melted in the presence of saturating DNA dyes. The latter, relatively new, method allows screening for unknown mutations or DNA modifications. The LightCycler® 480 real-time PCR system is a multiwell plate–based instrument that provides integrated applications for detecting and characterizing genetic variation using all these methodological approaches. High-resolution melting curve analysis (hrMCA) is an attractive technique to scan for unknown mutations in genes. To evaluate how easy or difficult it is to design hrMCA assays using the LightCycler® 480 Instrument, we selected 3 different fragments in exon 11 of the BRCA1 gene, designed an MCA assay, and tested its sensitivity to detect known variants. Large-scale, PCR-based gene analysis can only be performed if signals are generated, captured and analyzed in a highly reproducible manner. More precisely, thermal control, optical readout and the algorithms used to characterize genes qualitatively and quantitatively have to be highly precise and reliable. The LightCycler® 1536 System from Roche Applied Science meets these requirements. The novel platform, which utilizes a proprietary 1536-well plate, is capable of performing high-speed, qPCR-based DNA/RNA analyses in an array-like format. Break through to a new era in high-throughput real-time PCR with the powerful LightCycler® 1536 System, precisely engineered for miniaturization and parallelization. Increase throughput fourfold - Generate 1,536 data points in a single run in less than 50 minutes. Make the most of your resources - Use significantly less reagent and sample with reaction volumes of just 0.5-2.0 µl. Generate PCR data you can trust - Ensure research continuity with this extension of proven plate-based technology. Easily integrate into your existing workflow - Take advantage of this streamlined system, specifically designed for automation and high-throughput. LightCycler Nano system - Serious PCR. So much Fun! 1. The LightCycler® Nano Instrument produces high target specificity with high sensitivity characteristic of all LightCycler® Systems. 2. 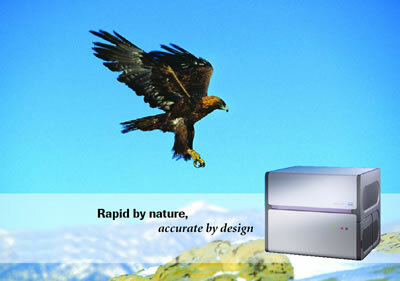 Fast protocols use state-of-the-art, 32-well thermal cycler technology for excellent thermal precision. 3. 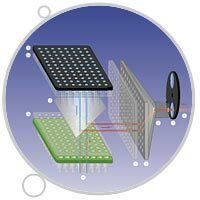 Robust solid-state optics provide complete spectral information. 1. Small enough for plenty of space on your benchtop. 2. Experience ease-of-use with flexible workflows. 3. Easily install using plug and play. 4. So quiet. You won't know it's running if it wasn't for the light show. 5. Intuitive software from assay setup to analysis. 1. The LightCycler® Nano System embodies experimental freedom. 2. The instrument uses standard 8-tube PCR strips that come with caps. 3. Flexible reaction volumes permit different levels of sensitivity. 4. Proven reagents for SYBR Green or probe-based assays are available. 5. Use different methods for quantification and mutation analysis, including HRM. 6. Use your preferred operating system, Mac OS or Windows, or go standalone with a USB flash drive. The RapidCycler 2 uses 1.5 mm Roche LightCycler® capillary tubes which are ideally suited for high-speed temperature cycling due to their thin walls and extremely high surface-are-to-volume ratio. By combining glass capillary tubes and air as the cycling medium we have cut sample temperature lag to less than a second, therefore yielding high temperature ramp rates. Inside RapidCycler's cylindrical reaction chamber, tornado-like conditions ensure both temperature uniformity and rapid heat exchange within the sample. this allows the RapidCycler to spend less than one second at the high and low temperatures and still be certain that each sample has reached the target temperature. 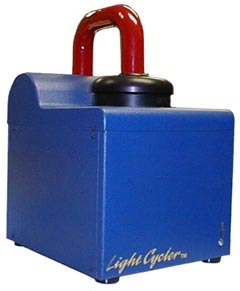 The original LightCycler was licensed to Roche and is no longer sold by Idaho Technology. Instructions: To obtain a copy of our latest LightCycler 24 & 32 software, contact us directly by e-mail or phone (801) 736-6354 x 349. Please have the serial number of your machine ready. 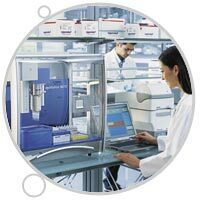 Eppendorf has developed a real-time PCR system that meets the requirements of the latest quantitative PCR applications. Comprehensive yet intuitive software paired with recent advances in real-time PCR technology make the Mastercycler ep realplex a critical contribution to modern science and research. The Mastercycler ep realplex features the latest technology, united with good design and a quality finish. A minimal number of moving parts in the optical detection module minimizes the vulnerability of the overall system and promotes consistently high sensitivity in your realtime PCR experiments. The overall system has been solidly engineered, to ensure quiet operation in the laboratory. The fluorescent dyes chosen for each experiment are excited by an array of 96 individual LEDs, which have a substantially longer lifespan in contrast to halogen lamps. The result is a real-time PCR system that is less susceptible, minimizing equipment downtime and the frequency of maintenance and associated delays to your experiments. The LEDs generate a blue light at a wavelength of ~470 nm, which can excite nearly all fluorophores used in realtime PCR (including SYBR®Green, FAM, VIC, TET, HEX, ROX, JOE, TAMRA). Emitted fluorescence is focused through an array of lenses and is passed to the optical detection unit through 96 individual optical fibers. Immediately upstream of the detectors, two high-quality emission filters with bandwidths of 10 nm to 30 nm are contained in a filter rotor. New type channel photo-multipliers (CPM) serve as the detectors, which in contrast to conventional photomultiplier tubes, are far less sensitive to magnetic field interference.